What is an Emergency WebViewer export? Safeguarding data is essential and this should be carried out using backups. However, a backup is not sufficient in some cases e.g. if a backup cannot be directly restored due to a hardware problem. In these cases, Password Safe offers the backup feature Emergency WebViewer Export. The Emergency WebViewer Export is based on an encrypted HTML file which can be decrypted using a corresponding key. Both files are required to view the passwords in a browser and form the core system of the backup mechanism. The Emergency WebViewer is included in the Enterprise and Enterprise Plus editions. 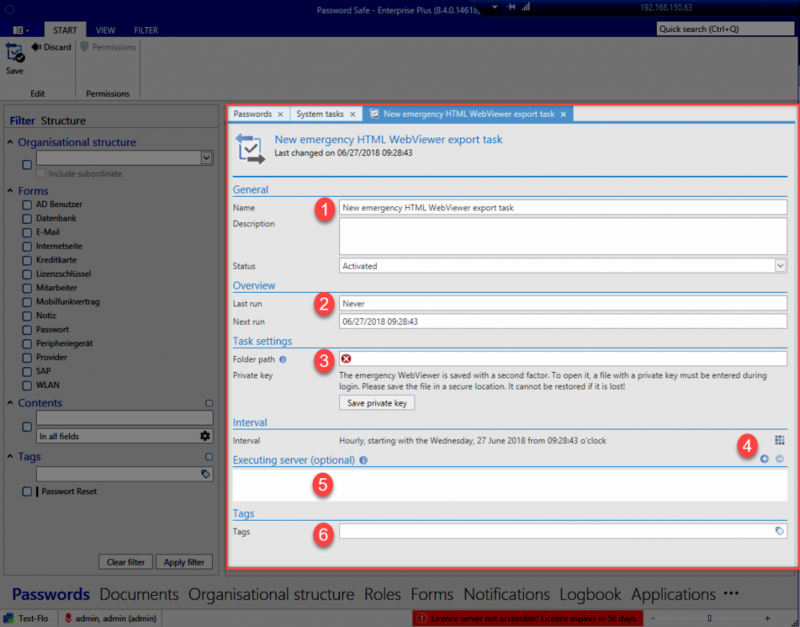 The Emergency WebViewer Export is created in Password Safe as a system task and this task can be used to guarantee a regular backup of the records (passwords) by entering an interval. When setting up the system task, the user thus defines the cycle at which the Emergency WebViewer.html file is created on the AdminClient. The existing file is overwritten in each case by the latest version at the defined interval. The associated key is only created once at the beginning and needs to be saved. The current version of the HTML file can only be decrypted using this key. 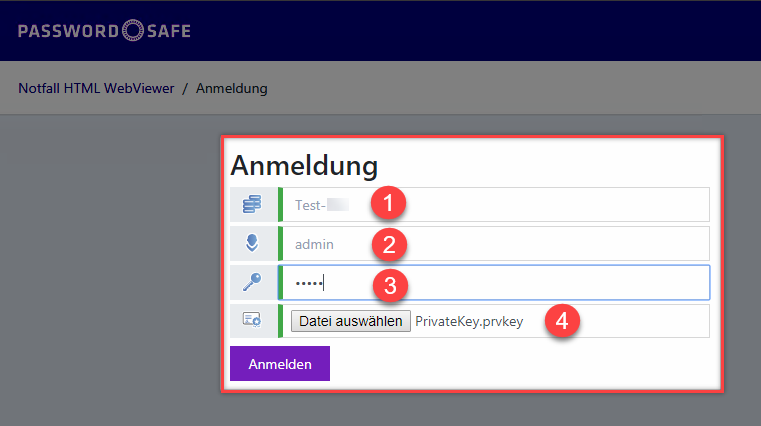 !The key (PrivateKey.prvkey) and the file (Emergency WebViewer.html) must be saved onto a secure medium (USB stick, HDD, CD/DVD, …) and kept in a secure location! !The export right for the passwords is not required for the Emergency WebViewer Export! The Emergency WebViewer Export creates two associated files. The associated key PrivateKey.prvkey is created on the client. 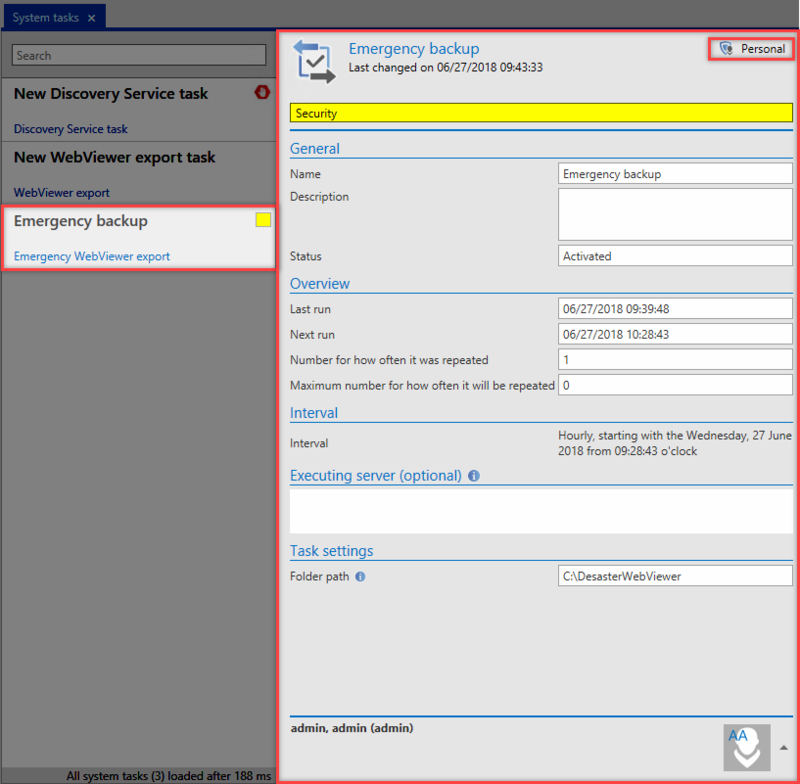 The Emergency WebViewer Export is set up as a system task. It can be called up in the main menu under Extras -> System Tasks. Clicking on New opens a new window and the Emergency WebViewer Export can be selected. The configuration page is then displayed. 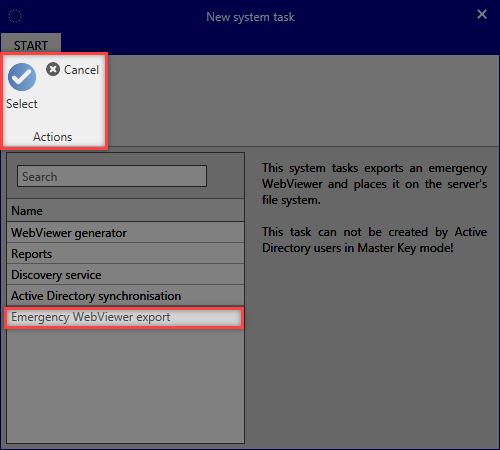 It is not possible to use the Emergency WebViewer Export with an Active Directory user. A new tab is displayed: New emergency HTML WebViewer export task This now needs to be configured in accordance with the requirements. !The private key for the Emergency WebViewer must be saved before the system task can be saved! 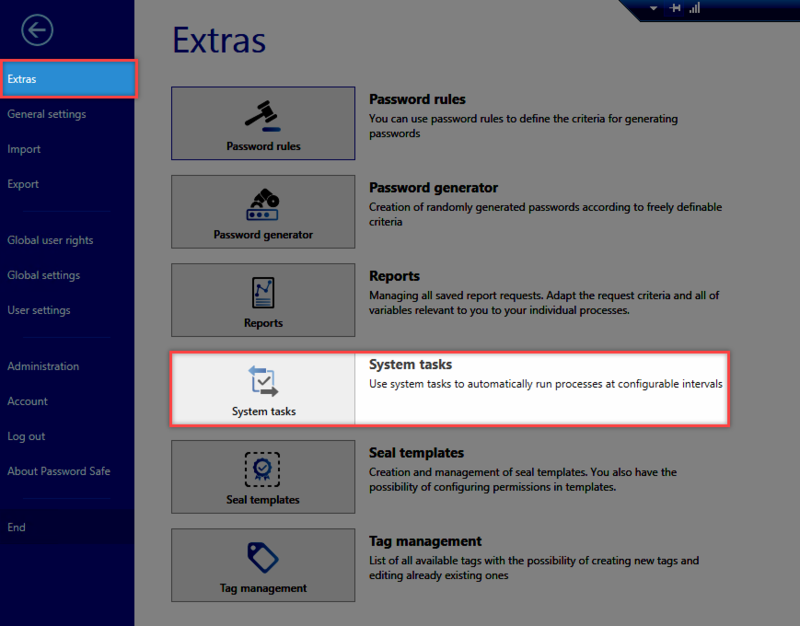 Once the configuration has been completed, the system task is displayed in the current module in the System Tasks tab. The user has the option of checking the data here. After the system task has been successfully executed, two files will have been created for the password backup. The Emergency WebViewer Export is used in the same way as the * WebViewer export. * The passwords are displayed in a current browser. 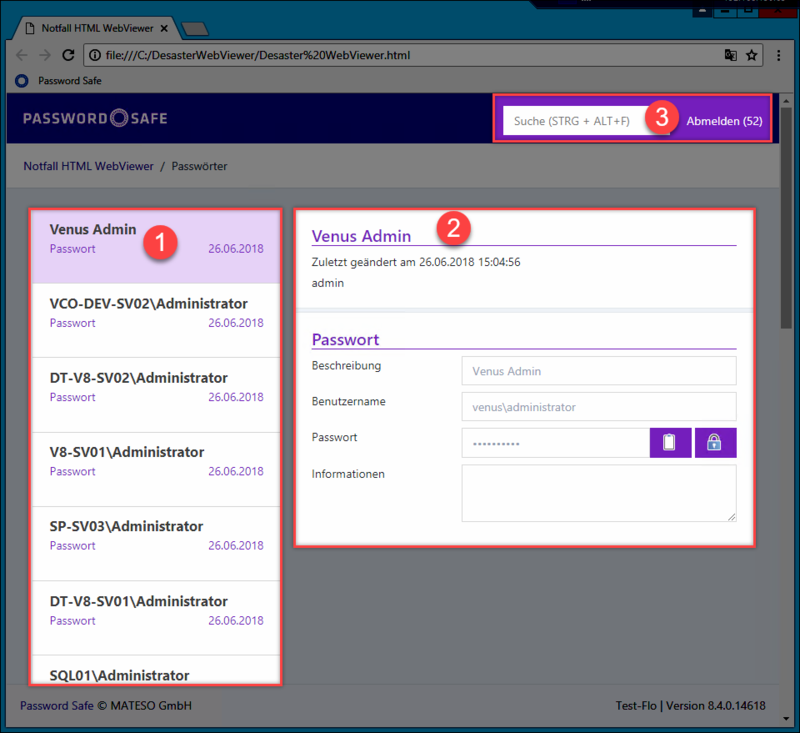 The passwords are accessed in the Emergency WebViewer Export with the user password and the key saved for the user. The search function is used to select the key (PrivateKey.prvkey) and also to check its validity. If all data has been correctly entered, it is then possible to log in. *The current user needs to log in using their password. If an incorrect password is entered, access is temporarily blocked. After successfully logging in, the overview page for the Emergency WebViewer Export is displayed. This contains information about the saved passwords just like with the WebViewer export. The passwords are now available to the user. The existing passwords are now available to the user for further processing. The HTML page is closed by clicking on Logout. If the user is inactive for 60 seconds, he is automatically logged out and the login is displayed with additional information. The user can log in again using the password and key as described above. After successfully logging in, the Emergency WebViewer Export overview is displayed again.